Fighting Fantasy treats from Daddy Ebay. I just wanted to share some totally random shopping news. 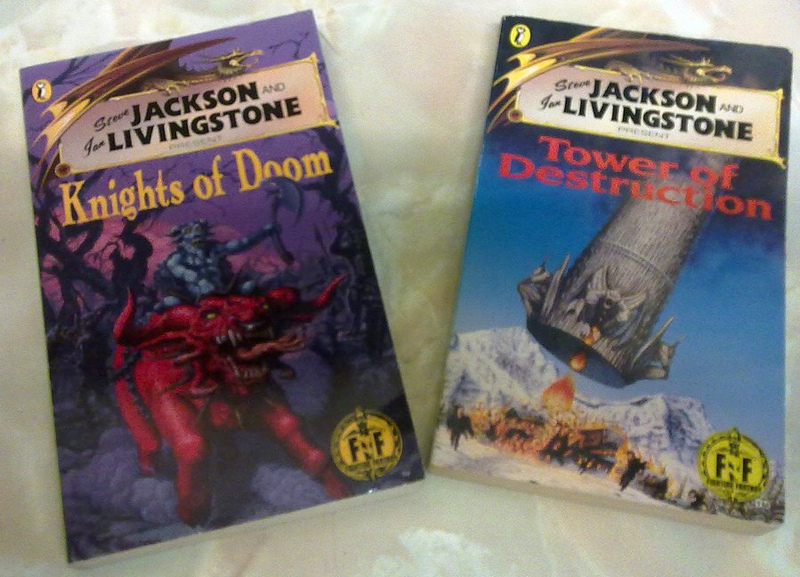 For phenomenally cheaper prices than they seem to be worth, I have two recent ebay acquisitions: Fighting Fantasy Books "Knights of Doom" (1994, 1st print, Puffin, Book 56) and "Tower of Destruction" (1991, 3rd print). These are for my personal collection which is still surprising light when it comes to the 40s and 50+ numbers. I bought them at fairly average prices, well under a fiver each and yet I've battled for Knights of Doom in the past which has been known to get well above 20GBP in bid wars. So I'm very happy. What's interesting is that neither book had a photo and one was listed as buy-it-now only. So there was a little faith required here. And you know the really good news? ... There's not a single mark on either Adventure Sheet. Novelist, writer and gamebook designer.